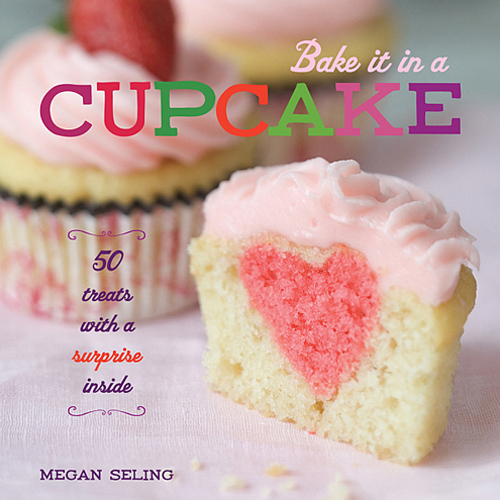 Today we're interviewing the creative mind behind Bake It in a Cupcake, Megan Seling! Her very first cookbook, Bake It in a Cupcake, was released October 2nd and she's extremely excited to share her amazing recipes with the world! My name is Megan Seling, I’m 32 years old and I am a writer and web content coordinator for The Stranger, a weekly newspaper in Seattle. Obviously, I love to bake and write. I’ve written for The Stranger for over 10 years, mostly focusing on music and food writing. I also love: pictures of baby animals, hockey (watching, not playing, I’m far too clumsy for playing), my cat who is sort of a jerk, candy, swearing (I don’t curse once in the book, though, I promise! ), and my husband (sorry, I know, don’t roll your eyes, he’s just awesome!). What inspired your love of cupcakes? Oh, where do I begin? I’ve loved cupcakes since… always. Not just cupcakes, but all baked goods and desserts. I have a massive sweet tooth. (Don’t tell cupcakes, but I have a pretty good thing going with ice cream right now, too.) But unlike so many other desserts, cupcakes are a really inviting thing to make. You don’t have to worry about decorating or transporting a whole cake, you can make as many or as few as you’d like. And, it turns out, you can also bake awesome things inside of them, which can be harder to do with a full-sized cake because there’s so much room for things to sink and shift and move around. Cupcakes hold things in place, nice and tidy. How did your blog Bake it in a Cake get started? It started as a joke, actually. I was making cupcakes for a friend’s party and, inspired by some half-off Easter candy, I decided to see if I could bake a mini Cadbury Crème Egg into a cupcake. It worked! I love to bake, but more than that, I love to make up my own rules and experiment and see what’s possible when baking. So I tried some other things—inside-out pineapple upside down cupcakes, cherry pies in cupcakes… some stuff worked, some didn’t, but it was fun. Then one afternoon I got bored and figured I’d start a photo Tumblr blog of all my baking exploits. I thought it’d just be a funny thing, nothing too serious, just showing pictures of half-eaten cupcakes, but people loved it. They wanted the recipes, they wanted to see more, so it pretty quickly became something much more intensive than I initially set out to do. But it was so much fun, so I kept doing it, and decided to see how far the idea could go. It went pretty far. If you look at some of the very first posts, there aren’t recipes and the photos are BAD. Ha! I’ve come a long way in two years. You have some amazing recipes on your blog, are you a self-taught baker? When did you decide you wanted to take your website to the next level and create a cookbook? I can’t remember exactly when I decided to attempt a cookbook—it was quite a few months after the blog had been up. 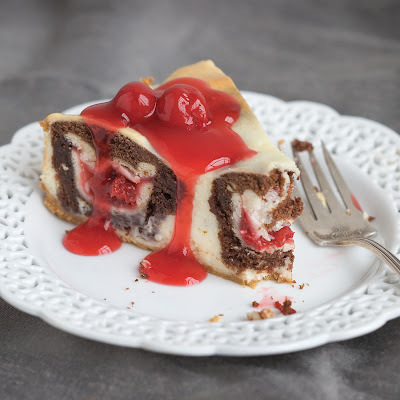 I had started to get e-mails from people who were interested in doing a Bake it in a Cake cookbook, but having never written or published a book before, I was hesitant to just jump into something. If I was going to do it—put that much time and energy into something—I wanted to do it well. So I got a literary agent (Renee Zuckerbrot, who’s AWESOME) and she helped me write a really strong proposal to send out to publishers and luckily there was interest in it! It definitely helped that I already had a presence on the internet. 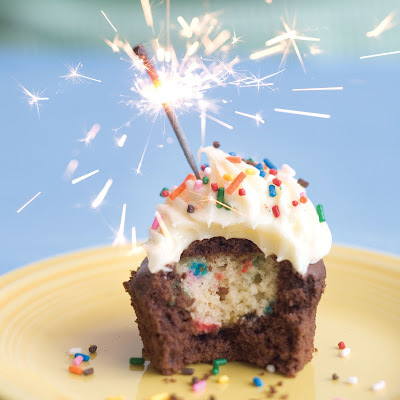 And while there are so many cupcake cookbooks out in the world, people were still drawn to Bake it in a Cupcake because it was doing something different with cupcakes, taking them to kind of a ridiculous level, I know, but a really fun and delicious level, too. What is your favorite recipe that you’ve created? That has to be the pumpkin pie-stuffed cupcakes. I am a pumpkin pie fanatic and when baked into a cream cheese cupcake, it gives the cupcake a custardy, creamy center that is just amazing. Plus there’s a little flaky, crispiness thanks to the pie crust. It’s so, so good. I top them with cinnamon cream cheese buttercream, so they taste like fall, which also happens to be my favorite season. I make them a few times every year. A close second would be the crème brulee cupcakes that I just posted on the website just a couple weeks ago. I have to give my husband credit for coming up with the idea. The crème brulee is in a little cupcake dish instead of a ramekin, still topped with the glassy layer of caramelizing sugar. Genius. Yes! THANK YOU to everyone who’s sent me photos or kind words, come to my bake sales, bought or even considered buying my book, or made me smile in any other capacity. This has been a hilarious, fun experience and (cliché alert!) it absolutely would not have happened without the kindness of my family, friends, colleagues, and strangers. So sincerely, to all the sugar-loving people in the world: THANKS. Also: Be awesome. Everyday. Order your own copy of Bake It in a Cupcake now!